The study examines the application of the post-World War II U.S. Armed Forces propaganda analysis methods as a valid framework for the analysis of modern extremist social media. Using Jihadist and Islamic extremist, Al Qaida core, affiliate and associate (AQAA), digital media products, the framework examines persuasive devices used to attempt to appeal to potential recruits and ultimately incite them to violence. The findings of the content analysis extend previous examinations and provide a unique lens in which to view the appeals used in messaging to encourage potential violent actors in civil society. The examination categorizes tools of persuasion with the aim to validate the applicability of a historical framework in exploring modern messaging, informing future counter-narratives, and providing law enforcement cues in the analysis and determination of ongoing threats in their respective jurisdictions. When two pressure cooker bombs exploded, tragically ripping through the crowds of the 2013 Boston Marathon, few realized online extremist propaganda served as the instructive source and inspiration for the attack (Durante, 2013). At first glance, the attack, which used a homemade pressure cooker explosive device, appeared to have been inspired by the article “[how to] Make a bomb in the Kitchen of Your Mom,” published under the nom de plume of ‘The AQ [al Qaeda] Chef’ in the summer 2010 edition of Inspire, an online magazine created by Samir Kahn, a media-savvy young Saudi-American radical Islamist. Khan published in colloquial English using mocking editorials, such as “…A Cold Diss,” (Khan, 2011) designed to appeal to the heart of young, and yet unknown, radicalizing Americans. The goal of his sometimes humorous, often sarcastic, but always religiously and politically extreme magazine was and is, to incite the reader to violence. Khan died in a drone strike in Yemen in 2011, before America would witness the impact of his deadly, destructive work. Yet his self-proclaimed ‘open source jihad’ (Richards, 2013) survived in the global commons of the Internet and continues to provide motive, method and encouragement for violent crimes such as the one on the streets of Boston (Zelin, 2011). The nature of the ongoing global war of ideas places local level law enforcement in the front line of a complex and networked conflict. In today’s war, words tweeted from Africa could incite to violence an anonymous actor in a jurisdiction thousands of miles away from the message’s origination. Equally, a small poster printed from the Internet and hung in a local bodega may look beautiful and peaceful with flowers and bright colors, but could actually be an embraced call to violent jihad and glorification as a “martyr.” The ability to independently transmit these images and narratives to a like-minded global community empowers individual actors and has resulted in unprecedented abilities to virtually recruit ‘true believers’ as proxy actors or foot soldiers in an Islamic extremist movement. Often, language barriers and cultural divides make much of online extremist content difficult for local law enforcement to understand, much less assess as a potential threat to their jurisdictions and communities. In this way, research into the divination of the meaning of rhetoric by navigating the murky latent and manifest content (Berg & Lune, 2011, p. 343) of extremist products for methods of radicalization is essential in refining approaches to countering violent extremism. This study uses a content analysis to examine a sampling of violent extremist organizations’ digital products  in order to determine if a framework used by the U.S. Armed Forces for propaganda analysis in World War II to counter nation-state propaganda is applicable in analyzing the messaging of a modern amorphous enemy. Unlike the seminal work of Ramsey (2013) in analyzing the disparity between online and offline activities and consumption patterns of online content, this examination is limited to examining appeals used by AQAA and localized jihadists or Islamist organizations in addressing audiences they seek to radicalize. The findings of this content analysis extend the analyses of previous examinations and provide a unique lens in which to view the persuasive appeals used in messaging designed to encourage potential violent actors in civil society. The United States describes a terrorist organization as a foreign organization that engages in terrorist activity as “defined in section 212 (a)(3)(B) of the INA (8 U.S.C. § 1182(a)(3)(B)), or terrorism, as defined in section 140(d)(2) of the Foreign Relations Authorization Act, Fiscal Years 1988 and 1989 (22 U.S.C. § 2656f(d)(2))” (Department of State, 2012). The nature of a foreign terrorist organization (FTO) is an organization that threatens the security of United States, its defenses, people, interests or relations (Department of State, 2012). U.S. Code 18 Part I, Chapter 41 § 875 further addresses the topic of interstate communications and communicating a threat as it relates to commerce. The legalities of terrorism under U.S. Code and the laws of other free nations may not be applicable in the global digital commons, making it extremely difficult to constrain violent rhetoric threatening a nation state, or community. Within the borders of the U.S., the First Amendment to the Constitution ensures free speech, and with that, a legal right to participate in a wide variety of questionable rhetoric. The limitations of free speech have been widely debated. The lines between fair political or ideological discourse, hate speech and incitement to violence or ‘fighting words’ can be blurry. For example, in an Al Qaida article for Inspire magazine, Samir Khan wrote “I knew that I had to stay under the guidelines of the laws regarding freedom of speech, but at the same time, I knew the real truth wouldn’t be able to reach the masses unless and until I was above the law” (Kelly, 2011). While Khan was never “above the law,” he sought refuge outside of the United States’ constitutionally-based rule of law in the sharia law system used in Yemen. Some researchers in communications find that any attempt to limit freedom of speech with regards to jihadist propaganda would serve only to reinforce a perception of “victimhood” or grievance used by Islamist organizations to garner a sense of outrage from the Muslim community. This concept is buoyed by Western media which often presents the actions of violent extremist organizations as ‘evil’ in turn, thereby creating an ‘us-versus-them’ or a ‘believer-versus-nonbeliever’ scenario. The jihadist narrative often constructs an appeal that provides an obvious choice between accepting the humiliation of their faith or taking action and rising to the occasion to become a community ‘hero’ or martyr. Action under this construct becomes an irresistible choice for some (Richards, 2013). The use of propaganda or the communication of ideas to bring about a change has evolved along with the shift from nation-state warfare to asymmetric threats from amorphous organizations. Violence or Propaganda of The Deed, (POTD), formerly existed through an act, or acts, of violence that sought to incite “excessive force” by a nation state thereby causing the state itself to lose legitimacy (Bolt, 2012). In the past decade or more, groups and individuals employed POTD violence as a strategic communication tool bent on mobilizing groups and individuals to violent action against ‘state targets,’ individuals, or iconic structures that represent nation-states (Bolt, 2012). Today’s amorphous enemy employs POTD internationally through dispersed leadership and lone actors. AQAA and other amorphous groups then have the ability to flatten their organization and carry out their “virtual jihad” even where nation-states have all but eliminated existing structures. The availability of the Internet created a forum for “virtual jihad” discourse on which AQAA relies on for recruitment and radicalization. As such, AQAA depends on individuals inspired to jihad rather than ‘organizationally led’ jihad (Jenkins, 2013). In this way, individuals do not require membership or physical residence of a nation-state, but belong to an online community of ‘believers’ inspired by digitally disseminated rhetoric and affiliated only through an ideological appeal. In 1998, the executive director of the Emergency Response & Research Institute (ERRI), Clark Staten, testified before a U.S. Senate subcommittee that “even small terrorist groups are now using the Internet to broadcast their message and misdirect/misinform the general population in multiple nations simultaneously” (Denning, 2000, p.1). In addition to his testimony, he provided the subcommittee copies of Internet messaging which contained “anti-American and anti-Israeli propaganda and threats, including a widely distributed extremist call for jihad (holy war) against America and Great Britain” (Denning, 2013, p.14). While the Internet provides a forum for discourse in the global commons, Staten’s testimony presaged the dangers and powerful impact of unfettered access to a global audience—a rostrum from which any individual with a computer has a voice that can achieve global reach. In the case of Al Qaida and other terrorist organizations, their voice includes the ability to communicate valid and ideational threats against America along with opportunities to make contact with like-minded thinkers, radicalize readers, and recruit new members. Simply put, the Internet provides terrorist organizations the ability to “communicate, collaborate and convince” (von Behr, 2013, p.6). Further, the ability of the Internet to disseminate images globally allows extremists to appeal to the emotions of members of societies and cultures including memories of grievance, whether real or perceived, as deeply-rooted ideological identities (Bolt, 2012). Von Behr’s 2013 case study, “Radicalization in the Digital Era,” demonstrated that the Internet increases an individual’s opportunities to be radicalized and serves to enhance the ability to locate others with similar extremist beliefs. The study examined Internet usage in the radicalization process of 15 terrorists and extremists in the United Kingdom (U.K.).The sample consisted of five extremists and 10 U.K.-convicted terror cases. The examination found that the Internet did not increase the pace of radicalization, nor did it replace individual contacts with extremist recruiters (von Behr, 2013, p. xii). The use of words and images to incite others to violence, however, is far from new. The Internet merely provides convenience of access and immediacy to information sought. A content analysis was conducted to identify what persuasive devices were employed in extremist digital media products, thereby testing the validity of a historical U.S. Army framework for analyzing propaganda found in today’s violent rhetoric. The U.S. Army framework was based on the original seven basic propaganda devices identified in the work of the Institute for Propaganda Analysis (IPA) established in 1937. Their work was rooted in the concern that audiences new to mass communications were unfamiliar with propaganda and critical thinking processes and therefore vulnerable to “extremist propagandists” (Sproule, 2001). The quantitative component in this assessment permits a determination of the frequency of psychological appeals, sentiments, or moral codes called upon in an attempt to spur violence. The analysis utilized 206 digital media messages drawn from across 63 identifiable factions of Al Qaeda core, affiliates, and/or associates or adherents (AQAA) included in the Combatting Terrorism Center Militant (CTC) Imagery Project collection at West Point (Department of the Army, 2013). The Imagery Project drew original Arabic language source material in and provides translation, originator, and an analysis of symbols. The 206 messages were originally disseminated via messaging boards, online forums, websites, or otherwise digitally transmitted across computer-mediated communication networks. While it is difficult to determine the date of creation of messages on the Internet where they can exist an indeterminable amount of time through re-tweets and re-postings or taken down and effectively erased, the messages examined appeared to have been originally created and posted between 2009 and 2012. The CTC’s sampling represents AQAA’s use of “images to further financial, material, and ideological support for violence” (Militant Imagery Project, 2013). The CTC dataset is cross-referenced by group identification, affiliation regions of operations, source, language, and the date the image was drawn from the Internet. For purposes of this study, the imagery selection was narrowed to those images described as jihadist groups affiliated with AQ core/central, affiliates and associates, and localized jihadist movements from across the available spectrum of digital media. While the CTC’s dataset is a small sampling of available extremist messaging, it provides an overarching glimpse at the array of approaches and appeals utilized by a wide cross section of jihadist extremist groups. To validate the CTC data set, twelve samples were randomly drawn from the collection. Independent translators  provided “double blind” translations of the original media products. The resulting translations minimally varied in word choice from the original CTC translations, and offered nearly identical meaning, thus supporting the accuracy and integrity of the translated data set. The analysis employed standardized operational definitions used by U.S. Armed Forces engaged in examining Cold War and World War II enemy propaganda. As such, the term “persuasive device” for purposes of this study refers to any of ten common frameworks used in propaganda: “selective issues, case-making, simplification, name calling, glittering generalities, testimonial, plain folks, band wagon, insinuation, stalling” (Department of the Army, 1950, p. 8). While the operational definitions were previously used in analyzing propaganda employed in nation-state conflicts, the commonality with today’s narratives employed in amorphous campaigns lies in the requirement of the movement to appeal to an individual and to incite that individual to identify with and support a cause. Indeed, “man’s thoughts and actions are compensatory substitutes for desires which he has been obliged to suppress” (Bernays, 1928, p. 9). As such, examination of the appeal for action exposes the base motivation behind individuals’ desire to act, whether within a nation-state for revolution, nation-state versus nation-state, or an ideological movement against a culture. The U. S. Department of the Army’s methodology provides the construct for such an examination. When utilizing the “selective issues” framework, the creator of a message evidences their concept of what is of concern, or is of issue for the audience. In “case making” or “card stacking” the author or artist draws upon what appears to be a logically built argument to give validity to their cause. “Simplification” reduces complicated issues to easily discernible clear-cut choices between extremes. “Name calling” uses hate to incite the audience and in some cases dehumanize the target. “Glittering generalities” ties the message to a virtuous quality such as dignity, righteousness, or honor. “Testimonial” employs endorsement by a respected party. Using “plain folks” appeal seeks acceptance through language or concepts that are common or “of the people.” “Band wagon” appeals are commonly used through the psychology that “everybody is doing it” and can result in a mob mentality. “Insinuation” does not necessarily use facts, but instead employs suspicion to confirm pre-conceived notions or to plant distrust. Finally, in “stalling” a propagandist will ignore an issue negative to his cause or mention it only occasionally until it doesn’t matter anymore. He/she may also talk about a myriad of other facts in order to make unfavorable evidence seem unimportant (Department of the Army, 1950). The 206 media products included English translations of the original Arabic language products. Additionally, the communications included an imagery analysis by cultural subject matter experts who analyzed the latent and manifest textual and artistic evidence for meaning. The descriptions included contextual meanings of symbols, colors, phrases, slogans, religious texts and references. This derivative study then examined those interpretations to determine each sample’s overarching appeal or narrative theme used to incite the intended audience to action. The latent and manifest content device was then coded by two independent coders into categories along the three dimensions of organization, overarching theme, and type of persuasive devise. Differences in coding results were brought to the attention of a panel consisting of three other researchers and included once a consensus was reached. 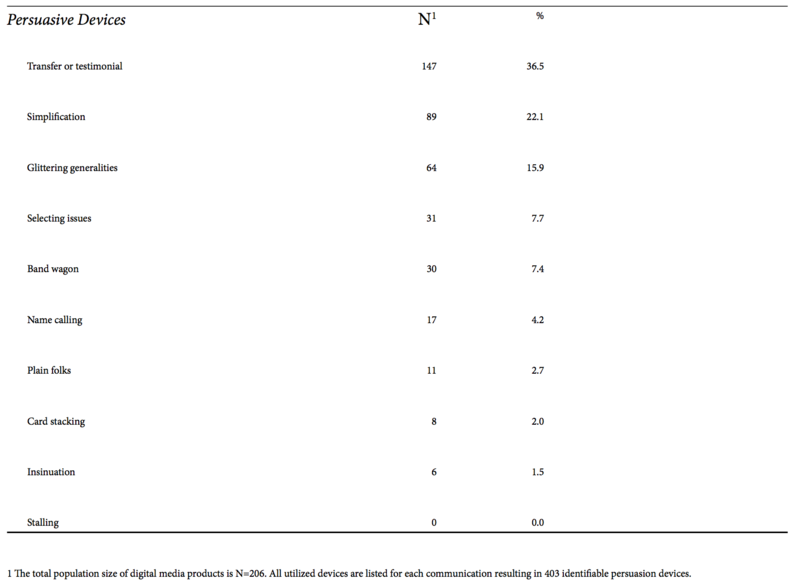 Table 1 shows the breakdown of analyzed media types. Website banners and logos from Al Qaida core, as well as its affiliates, and associates, comprised 76.8 percent of the 206 samples. The remainder of the content from these organization included video or audio files, online magazines, posted text files, or imagery posted to forums. Each of the samples invariably included more than one theme or message. As such, each theme was noted and tallied. As a result ten overall themes emerged. The predominant overarching theme was a blatant call to violence or “jihad,” appearing in 163 samples. For purposes of inquiry, “jihad” refers to any call to religiously inspired revolt or violence outside of the rule of civil or nation-state law. The call to violence was frequently accomplished in latent imagery through the darkened silhouette of a horse and rider carrying a black battle flag with the text of the “shahada,” the Islamic testimony of faith, and Mohammed’s seal (Department of the Army, 2013). In a related theme, there were 107 instances, or 23 percent of latent and manifest content in which the samples thematically glorified the concept of martyrdom. The imagery of glorification included pictures of individuals perceived as martyrs by Al Qaida, their affiliates and associates, floating in clouds, as heavenly images, or in tranquil scenes with rays of light and/or expressed quotes from the Qur’an endorsing and glorifying their behavior. The collection provided 69 instances, or 15percent of content presenting the aims of achieving a global Islamic caliphate. Further, 32 instances (7 percent) evidenced vengeance as a thematic. In some cases, the communication pointed to the crusades and/or other perceived ongoing persecutions of Islam derived from current social or political contexts. In six percent of the collected data or 27 instances, the thematic concept of nationalism, loyalty to a nation-state, or the need for a nation-state was evidenced. One organization, for example, posted a logo with a green flag background declaring themselves to be “Dawlat Filastin al-slamiyya-Wilayat Ghaza, or the Islamic State of Palestine-Gaza Province” (Department of the Army, 2013). 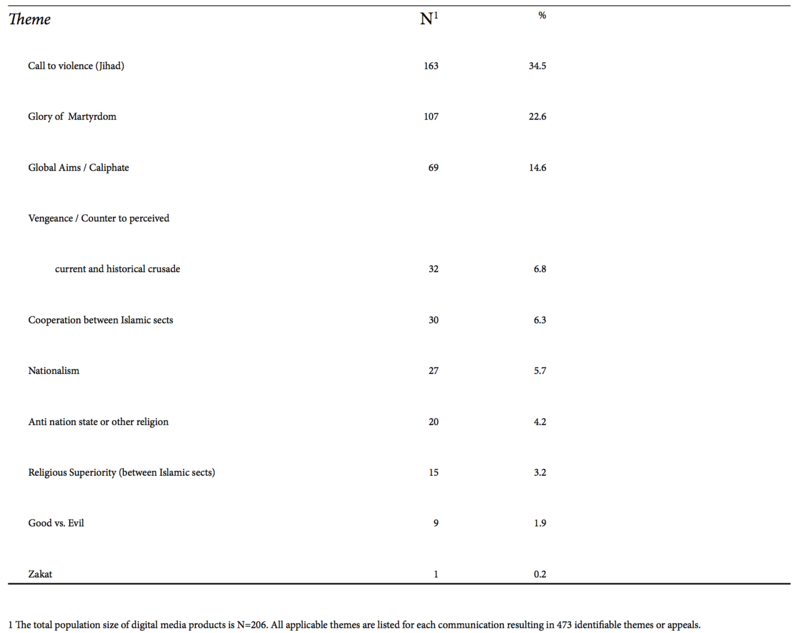 Conversely, four percent of messages, or 20 instances, presented anti-nation-state and/or negativity toward any religion outside of Islam as a thematic. These instances predominantly included anti-American images such as burning U.S. flags, anti-Israel statements, or latent and manifest content expressing hatred of the Jewish people. In one instance, an AQ affiliate presented anti-Russian themes along with the theme of vengeance for perceived abuses in Chechnya. In another roughly six percent or 30 instances, the messages presented the need for cooperation between Islamic sects to achieve their aims. In three percent or 15 instances, the theme was the superiority of one Islamic sect over another. These instances predominately highlighted Shiite and Sunni differences. In a separate tact, the data evidenced a basic archetypal theme of good versus evil. This theme was employed in a scant two percent or nine instances, with text or slogans referring to non-Islamic people as “evil doers” (Department of the Army, 2013). Finally, in a single message, Al Shabab couched the theme of anti-“infidels” with the theme of “zakat,” or charitable giving. The imagery depicts Al Shabab members distributing goods. Charity, as a theme, was a single aberration in the sampling. After each message was coded for single or multiple persuasive devises, the frequency for each device was calculated by product and percent of total. The percentage values had a relatively wide range from two percent to 36 percent with clear preferences for some devices over others (Table 3). Most frequently (in 36 percent of the messages), the creators of the digital imagery employed the use of transfer or testimonial. Testimonials were given by leaders of Al Qaida such as images and quotes from Osama Bin Laden, or implied through the images of “martyrs.” Also included were quotes from the Qur’an in order to imply religious credibility of the movement or organization. In 22 percent of the communications, the extremist actors employed simplification as a tactic of persuasion. For example, in a forum banner produced by Dawat al-Iraq al-Islamiyya or the Islamic State of Iraq, also known as Al Qaida Iraq (AQI), the actor manifested the conditions in Iraq in the slogan “the beginning of the end.” In addition, the banner includes an image of Osama Bin Laden with his finger pointing upwards—a gesture often given when Muslims recite the shahada or testimony of faith. The use of the image attempts to persuade the viewer by simplifying their cause to a choice of faith, with tacit endorsement of the organization as a religious edict. While images in communication have been present since man first scrawled figures on cave walls (Müller-Brockmann, 1971), modern social media has now made them powerfully ubiquitous (McComiskey, 2004). Today’s social media rhetoric incorporates a concentration of iconic images, graphics and text in a “blurred and fluid informatics realm” (Stafford, 1996, page #). The meaning of images therefore must be considered in the analysis of “optical rhetoric” (Stafford, year, page #). Another example of simplification was evidenced in the Internet forum banner of the Indonesian jihadist group Jama’a Islamiyya (JI). The banner presents the theme of cooperation across Islamic groups with an image similar to the Iwo Jima memorial. In the image, militants are raising the Palestinian flag. The caption simply states “We All Gaza” (Department of the Army, 2013). Sixteen percent of messages or 64 products employed the use of glittering generalities as a persuasive device. The use of glittering generalities provides authenticity to a message by linking the objective to a culturally accepted virtue. The most common appeal found in the samples was that of ‘holiness’ latently expressed in images of the Qur’an, the Dome of the Rock, and other sites and objects held as holy by the Muslim people. In another example, Usama Abdallah Kassir posted a banner under the name of “Zubeiddah1417” (Department of the Army, 2013). Among other devices, Kassir appealed in glittering generalities to a Muslim sense of “pride, honor and paternal responsibility” (Department of the Army, 2013). The technique of persuasion through selecting issues was found in eight percent of the samples or 31 products. In one instance, the posted image included a picture of a detainee being abused at Abu Ghraib prison. In a scant three percent of messages or 11 products was persuasive appeal known as “plain folks” evidenced. In one sample Ayman Al-Zawahiri was depicted as being of the tribes and generations suggesting that he was simply one of the viewer’s kind. Other content included images of the desert, suggesting a common, simple and ancient shared history, or the use of commonly used expressions. Two percent of samples or eight products used case making or card stacking as a device. One sample appealed to the popular concept that the U.S. and other Western nations are engaged in a war of greed and a quest for oil in the Middle East. Latent content expressed this with images of foreign money and U.S. dollars, as well as manifest suggestions that westerners can be bribed. It furthers evidence of materialism in an attempt to illustrate the Western world as greedy. Another sample included a series of quotes from the Qur’an to build a case for the reader to come to the conclusion that embarking on a jihad is a logical and righteous decision. In addition, only six messages (two percent) employed the use of insinuation as a persuasive device. No evidence of insinuation was found in the textual manifest content; however, the choice of colors and other symbols, such as fire, shades of red, smoke, and dripping blood were employed to incriminate the U.S. and place the culpability for suffering on the West. No evidence of stalling was found in any of the samples. Stalling, however, may include the avoidance of issues. Determining a negative could not be assessed in the scope or method of this examination. Zero evidence of stalling suggests that it is not a persuasive device employed by Al Qaida, their associates, or affiliates. The presented analysis of persuasive devices seeks to further the understanding of propaganda tactics employed by some of the most dangerous terrorist organizations in their utilization of Internet technology for recruitment purposes. While the organizations examined are widely geographically dispersed across continents, they are inextricably linked through their promotion of Islamic extremism. The desire to promote the concept of jihad locally or globally suggests that the all groups primarily identify themselves as Muslim, and only secondarily as a member of a nation-state or other culture. The analysis is based on the Combatting Terrorism Center Militant Imagery Project collection at West Point, a United States’ Department of Defense reviewed and sanitised dataset. The violent extremist organization’s imagery and narrative was found to primarily include traditional Islamic symbols, suggesting an attempt to appeal to people of the Islamic faith as a legitimate Qur’an-based movement and call to action. Imagery examined included quotes from the Qur’an and images of ancient mosques. Imagery also included drawings or photos of religious “martyrs” or the Shahada black horse and rider believed by many to be carried by Mohammed. These symbols of “jihad” portray to the intended audience that violence is a religious duty in a perceived defense of Islam. This is a clear call to choose between a radical and violent perception of faith, or a complete condemnation and rejection by the ‘faithful.’ The postings of Al Qaida offer no middle road, leaving Muslim adherents in a false conundrum to choose the religion of their birth and culture or risk the label of traitor to all they know. This false dichotomy takes on an entendre of blackmail in a polarized world. Such a choice may bring about faster and more enthusiastic responses, adding to the urgency of the choice in the constructed crisis (Bernays, 1928). In the constructed choice between faithfulness to Islam and ‘haram’ (sinfulness or ‘forbidden’), the archetypal choice is the perceived ‘good versus evil.’ The targeted audience knows that any perceived rejection of Islam by a Muslim can bring not only cultural opprobrium but the punishment of death. Additionally, when examining the significance of this study, it is important to note some unavoidable limitations of the dataset in professional public discourse. While the Combatting Terrorism Center Militant Imagery Project collection at West Point presents the most comprehensive collection of translated communications available to the public, its content is, by necessity, censored. Noticeably omitted from the collection are graphic images of violence, such as videos of beheadings, which are circulated widely throughout social media. While this is not a criticism, as the Combatting Terrorism Center obviously seeks to reduce the proliferation of violent images and their attendant influence, this systematic omission precludes one important persuasion tactic from the present findings—the use of graphic depictions of violence. Like the proverbial car wreck that rivets the attention of other drivers, graphic violence draws attention to their movement, and contains a perceived narrative of traditional religious values carried out through customary Islamic perceptions of justice. A second, minor limitation arises from the examination of only AQAA or local violent extremist-generated products. This narrow look eliminates the influences of popular media messaging in regard to violent extremist issues. A wider scope in future studies could examine the context of popular media’s impact on societal and individual perceptions or behaviors. Furthermore, future studies could compare and contrast the persuasion devices utilized by other violent extremist organizations, movements, coups, or insurrections. A wider lens examining other calls to violence could yield evidence of similar, alternate, or related patterns of persuasion. Lastly, this study of influence products does not take into account the ratio of latent and manifest content that could be affected by literacy rates of the targeted audience. A future comparison of literacy rates to radicalized martyrs may find significance in a number of illiterate actionable martyrs. Despite limitations, the study found that the rubric of persuasive devises rooted in the work of the IPA, and operationalized by the U.S. Army to examine violent rhetoric, is as valid today in analyzing social media as it was before the creation of the digital commons. The study found that with the exception of the “stalling” technique, the examined samples could be categorized and analyzed through the historical framework. “Stalling,” which attempts to marginalize an issue while flooding “new ones to distract” (Department of the Army, 1950, p.10) was not found in any samples drawn from modern extremist social media. Interestingly, “stalling” was not included in the original seven common propaganda devices offered by the IPA. The U.S. Army publication added ‘stalling’ to the framework and found many examples in World War II nation-state propaganda. It has been long understood that the ‘the pen is mightier than the sword…’ (Lytton, 1839, 2.2. ), the digital pen of the 21st century promises to be the mightiest yet. This fact is far from lost on those who wield the scimitar in today’s violent clashes of culture and ideology. Unfortunately, the violence summoned on the Internet does not remain purely in the virtual world. Instead extremists violently manifest in communities in the jurisdictions of local law enforcement officials, such as the streets of Boston. While federal law enforcement and whole-of-government approaches pursue the perpetrators of terror, it is the local police who are left to react on the scene. Within the U.S., empowering local law enforcement with information to recognize emerging threats to their communities, coupled with enhanced cross-agency intelligence assistance, could assist in preventing attacks. But ultimately, international problems are local problems. Expanding access and collaboration with international organizations such as Interpol and pushing needed information to the front lines of analysis and prevention could enhance understanding, build partnerships, and ultimately secure communities. Julia E. Wright is a defense contractor with American Protection Service supporting the industrial security department at Lockheed Martin’s Fort Worth Aeronautical Division. Ms. Wright is a graduate of the College of Criminal Justice, Texas Christian University where she augmented her studies with an emphasis in defense studies. Her independent research focuses on federal efforts in combating terrorism inclusive of military partnership and whole of Government approaches to law enforcement as it relates to international security and the nexus of recruitment strategies, international crime and subsequent manifested violence. Michael Bachmann is Associate Professor of Criminal Justice at Texas Christian University. He received his Ph.D. in Sociology from the University of Central Florida in 2008 and his M.A. in Social Sciences from University of Mannheim, Germany in 2004. Dr. Bachmann specializes in the investigation of computer and high tech crimes. His research focuses primarily on the social dimensions behind technology-driven crimes. He is the author of several book chapters and journal articles on cyber-crime and cyber-criminals. Berg, B. L. & Lune, H. (2011). Qualitative research methods for the social sciences. (8th ed). Harlow, UK: Pearson. Bernays, E. (1928). Propaganda (1st ed., p. 9). New York: New York: Routledge. Bolt, N. (2012). The violent image: Insurgent propaganda and the new revolutionaries. New York: Columbia University Press. Denning, D. (2001). Activism, hacktivism, and cyberterrorism: The Internet as a tool for influencing foreign policy. Retrieved March 3, 2014 from the RAND Corporation website: http://www.rand.org/content/dam/rand/pubs/monograph_reports/MR1382/MR1382.ch8. Department of the Army. (1950). Special Text no. 21 Propaganda Analysis (301.152A). Fort Riley: The Army General School. Miller, C. (1937). Propaganda analysis. New York: Institute for Propaganda Analysis. Müller-Brockmann, J. (1971) A history of visual communication. Trans. D.Q. Stephenson, New York: Hastings. Ramsey, G. (2013). Jihadi Culture on the World Wide Web: New directions in terrorism studies. New York: Bloomsbury Publishing. Sproule, J. (2001). Authorship and origins of the seven propaganda devices: A research note. Stafford, B. (1996). Good looking: Essays on the virtue of images. Cambridge: MIT Press. Samples drawn were attributed to or claimed by the following organizations media products: Al Qaeda, including affiliates such as Al Qaeda Central or AQC; Al Qaeda in the Arabian Peninsula, or AQAP, which publishes “Al Shamikha” for women, and Al Qaeda Yemen’s “Sada al-Malahim” or “Echo of Battle” magazine; Al Qaeda Iraq or AQI; Al Qaeda in the Islamic Maghreb or AQIM ; AQ Palestine; and “al-Malahim” which is also simply known as AQ’s “Media Production Company; Coalition of Intifada Youth to Liberate Palestine; Dawlat al-Iraq al-Islamiyyah; Dawlat Filastin al-slamiyya; The Egyptian Islamic Jihad; Fath al-Islam or “Conquest of Islam”; The Global Islamic Media Front; Groupe Salafiste pour la Prédication et le Combat; Hamas ‘Izz al-Din al-Qassam brigade; Harakat al-Mujahidin; Islamic International Peacekeeping Brigade; Islamic Movement of Uzbekistan; Isittihad al-Jihad or Union of Islamic Jihad of Uzbekistan; Jund Ansar Allah; Jama’a Islamiyya; Jama’at Ansar al-Sunna; Jaysh al-Mujahidin; Jaysh Ansar al-Sunna; “Prisoner of Joy”; Jaysh-e Muhamma; Jama ‘at al-Tawhid wal-Jihad;Jundallah or People’s Resistance Movement of Iran; Jund Ansar Allah; Jhangvi Group; Jama ‘at al Da ‘wa Pakistan/ Lashkar-e Taiba; Majmu at al-Sarim al-Maslul al-Baridiyya; Moro Islamic Liberation Front; Mu’assasat al-Ma’sada al-l’lamiyya; Muntadayat al-Firdaws al-Jihadiyya; Muntadayat bi-smi al-Iman; Nukhbat al-l’lam al-Jihadi or “Jihadi Media Elite”; Palestinian Islamic Jihad; Palestinian Muslim Brotherhood or Abdallah ‘Assam’; Palestinian Islamic Jihad; Riyad al Salihin or Chechen Martyrs Brigade; Sawt al-Jihad which is also known as Sawt al-Mujahidin; Shabakat al-Jihad al Alami; Shabakat sham al-Ikhabariyya; Sipah-e-Sahaba Pakistan; Taliban Ansar Al-Mujahidin Network; Tanzim al Tajdid al-Islami; Tanzim Fath al-Islam also known as “Fatah”; and Tehrik-I Taliban Pakistan – Swat. Independent translators were native speakers of the language in which the samples were published, certified by the American Translators Association, and utilized the Standard Guide for Quality Assurance in Translation published by ASTM International for consistency.